Signed as an amateur free agent in 1956 by the Indians out of Campbell University, the 6-foot-4 right-handed Jim Perry quickly worked his way to Cleveland as a 23-year-old in 1959. Working as mostly a reliever and a part-time spot starter, Perry finished his first year 12-10 with a 2.65 ERA in 153 innings of work, finishing behind the Washington Senators' Bob Allison in the Rookie of the Year voting. In his sophomore season, Perry would led the American League in wins (18), starts (36), shutouts (4) and home runs allowed (35) while tossing 261 1/3 innings for the Tribe. This performance would earn him a spattering of MVP votes as the Indians finished 76-78 in 1960. Between 1961 and 1963, Perry's career would divest from its original tracks as he would go 22-29 in 417 1/3 innings of work, and watched his ERA bloat to 4.44 as his strikeout rate dipped to 3.5 per nine innings. 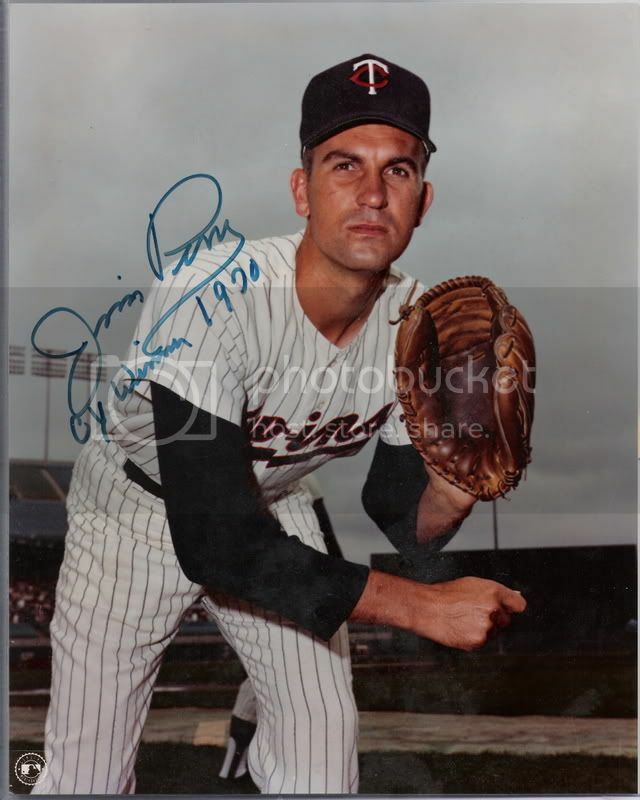 When the Twins acquired Jim Perry from the Cleveland Indians, they traded for a 27-year-old swingman that had promise but was mired with a franchise that continued to miss the .500 mark in the early 1960s. Upon his arrival to Minnesota, two things differed and had an immediate impact on his results: offensive and defensive support. While a member of the Indians, the Tribe scored 3.92 runs per game. After relocating to Minnesota, Perry's new team was scoring an average of 4.76 runs per game. The Twins also provided Perry with far superior defense -- one that was 70 fielding runs above average compared to the Indians that would be 17 fielding runs in debt. For a non-strikeout pitcher that is reliant on the eight other guys on the field, that was a huge advantage. Because of this, from 1964 to 1969, Perry would go 65-36 in 226 starts, post an ERA of 2.72 and increase his strikeout rate to 5.5 per nine innings of work. Perry's WHIP (1.130 - 2nd in AL) was superior to Cuellar's (1.149 - 4th in AL). In spite of having fewer overall strikeouts, Perry had a better strikeout-to-walk ratio (2.947 - 2nd in AL) than Cuellar (2.754 - 4th in AL). Even though both McNally and Cueller managed to replicated Perry's win total and starts (24 and 40) there total appears to be a byproduct of a potent Baltimore offense. The Orioles scored the pair more than a run above league average (5.17 and 5.32, respectively) and, unlike McNally and Cuellar's 24 wins, Perry's two dozen appear far more genuine when you consider the Twins generated 4.47 runs per game when he was on the mound. Furthermore, McNally (.697) and Cuellar's (.667) had higher OPS against than Perry (.643). In this context, Perry's 24 victories is a much better total. His ERA (2.92 - 5th in AL) was better, albeit slightly, than Perry's (3.03 - 8th in AL). McDowell gave up far fewer hits per nine innings (6.694 - 2nd in AL) than Perry (8.3). He struck out (8.9 - 1st in AL) three more batters per nine innings than Perry (5.4). McDowell averaged Game Scores of 63 while Perry averaged 56. McDowell had a lower OPS against (.619) than Perry (.643). McDowell would have the disadvantage of not only playing for an Indians team that not only gave him pitiful run support (4.05 runs of support per game below the league average of 4.17) but his team was 32 games behind in the division. The Sporting News would agree with McDowell's case and name him the AL Pitcher of the Year in 1970. But regardless of the method, voters rewarded Perry for his gaudy wins total to narrowly beat out Baltimore's Dave McNally and Mike Cuellar and Cleveland's Sam McDowell to give the Minnesota Twins their first Cy Young award winner.